Let’s address the second argument first. I closely follow new technology developments that might impact oil and natural gas demand. So, should a totally new technology appear that does reduce demand for fossil fuels, you will hear about it here long before it becomes mainstream news. In that case we would definitely make some major changes to The Energy Strategist portfolios. I can tell you that someone is always claiming a breakthrough that will put an end to our ever-growing consumption of crude oil, but those claims invariably fall apart under scrutiny. Generally it isn’t the technology that’s the problem, it is executing that technology in a way that is at least remotely cost-competitive with oil. For historical examples, see my 2012 articleInvestors Beware of Fuel from Thin Air or Audi’s Audacious Fib from 2015. Both of these claims garnered tremendous media hype, but I explain in the articles why they aren’t economically viable routes to cost-competitive fuel. Year-over-year crude oil demand declined in only 3 of those 32 years, and in each case bounced back to the historical growth rate very quickly. Further, the average annual increase since 2010 has been well above the historical average at more than 1.5 million bpd per year. When I point this out to people who had suggested that oil demand is flat or falling, they will often pivot to the notion that it won’t be long before electric vehicles (EVs), alternative fuels, and higher fuel efficiency standards take a big bite out of oil consumption. In recent articles that I wrote for Forbes, I provided two examples that are contrary to this narrative. In the first article, I discussed Norway’s experience with EVs. Following years of very generous subsidies for EVs, Norway has the largest fleet of plug-in EVs per capita in the world. Norway’s growth rate for EVs has also been higher than that of any other country, averaging 110% per year for the past seven years. One would expect then a decline in Norway’s oil consumption. After all, Norway is surrounded by members of the European Union (EU), where demand for oil since 2008 is down 14% (primarily in response to much higher oil prices). Nearby countries like Denmark (-14%), Sweden (-16%), and Finland (-21%) all had big declines. 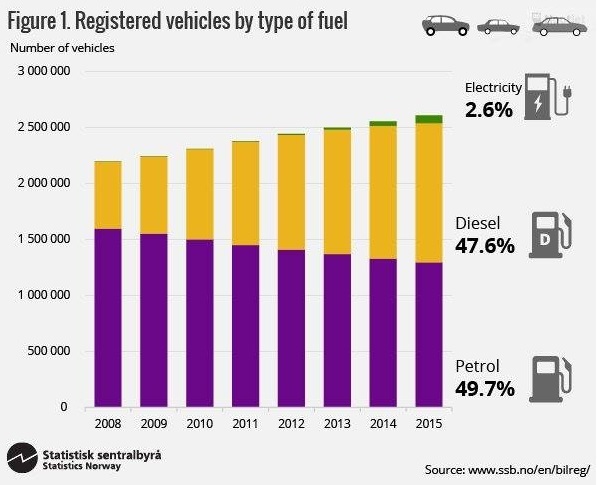 The huge growth in electric vehicles didn’t translate into a reduction in demand in Norway, because it is set against a backdrop of a rising population and growing fleet of vehicles on the roads (as is the case worldwide). Seven years of triple-digit growth for EVs haven’t been enough to dampen demand for oil. But how about in the U.S.? At least we know demand in the U.S. is down, right? I addressed that in another article: U.S. Gasoline Demand Reaches Record Levels. Several years ago gasoline demand in the U.S. did fall as a result of much higher oil prices and the 2008-9 recession stemming from the housing bust. This led some pundits to suggest that U.S. gasoline demand had peaked. After all, the U.S. has also seen big improvements in fuel efficiency of new vehicles sold, an explosion of biofuel production and impressive growth as well for EVs. But low fuel prices have a tendency to cause people to drive more. Thus, gasoline demand has bounced back, with the first six months of 2016 setting a record for gasoline consumption in the U.S. The Energy Information Administration (EIA) is now projecting that the full year will result in the highest ever gasoline consumption for the U.S. as well. So much for peak demand. Don’t get me wrong. 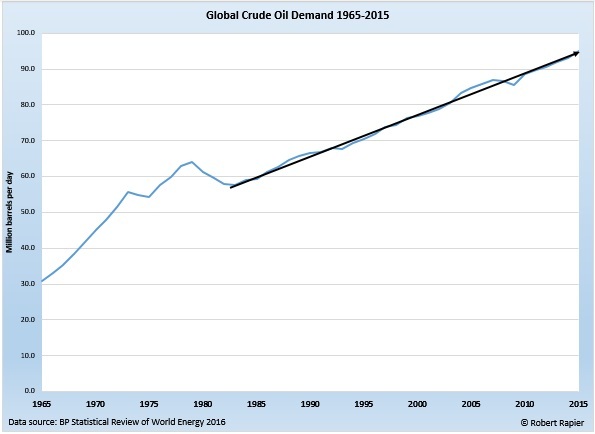 It’s not that I am unwilling to consider the possibility of an impending and inevitable decline in crude oil demand. It’s just that this view isn’t supported by the historical evidence or recent developments, and I can’t make a case that something will change here in the next decade. And at the end of the day I base my opinions on evidence, not hope or wishful thinking.